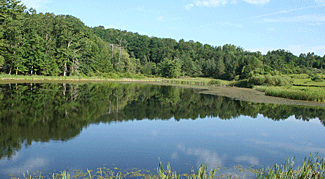 Spencer Crest Nature Center is part of Corning Community College and features two ponds and seven miles of trails across 250 acres of lush beauty. Dogs are allowed on the trails if they are leashed, but please do pick up after your dog. The Center's trails are open from sunrise to sunset all year long, and the nature center building is open Monday through Friday from 10:00 a.m. to 1:00 p.m. while the College is in session. For more information, call 607-962-9012. A map of the trail is available to download by clicking here. The trails are easy to walk, well-maintained, and you'll find a variety of plants, birds, and other wildlife. The trails vary in length, with the shortest being only a third a mile long. The Center also hosts a breeding pair of broad-winged hawks who return every April. Spring is the best time to walk these trails, as the migration brings all sorts of raptors to the area, including warblers and vireos.